So far the series has covered the differences between wide-angle and telephoto lenses and the inner workings of the Piezo Drive. Today's final installment explains Vibration Compensation — Tamron's proprietary image stabilization technology. Discovering you took a blurry photo is the worst. It's like being visited by the ghost of an amazing photo — a constant reminder you could have done better. You tried to set the exposure properly, you stood as still as possible, and yet there they are: swaths of fuzzy shadows where distinct figures should be. Tamron's Vibration Compensation (VC) aims to solve the above problem. Using a mechanism that employs a three-coil system that electromagnetically moves internal optical components within the lens, VC provides almost frictionless movement that allows for incredibly stable and clear images. Unlike other image stabilization technology that only moves in left/right and up/down patterns, VC covers diagonal motion as well. To visualize its full range, imagine a figure with eight intersecting lines instead of four. Move in any of those eight directions, and VC will operate. It also works throughout the entire zoom range and under low-light conditions, so you can shoot sans flash without getting any blur. Not terribly painful, right? And now you'll be able to understand this next part: the Tamron 18-270mm lens is a super powerful, all-in-one 15X zoom lens. It's made for use with Canon, Nikon, and Sony APS-C size DSLR cameras, and has won two major awards: the EISA Best Product 2011-2012 and the Japan Camera Grand Prix 2011. Weighing just 15.9 ounces and measuring 3.8 inches in length, the impressively compact lens features Vibration Compensation and a Piezo Drive. 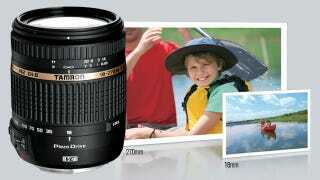 Head here now for a closer look at all of the features of the Tamron 18-270mm lens.